Southern gets back to .500 with a Homecoming win over Alabama A&M on Saturday. 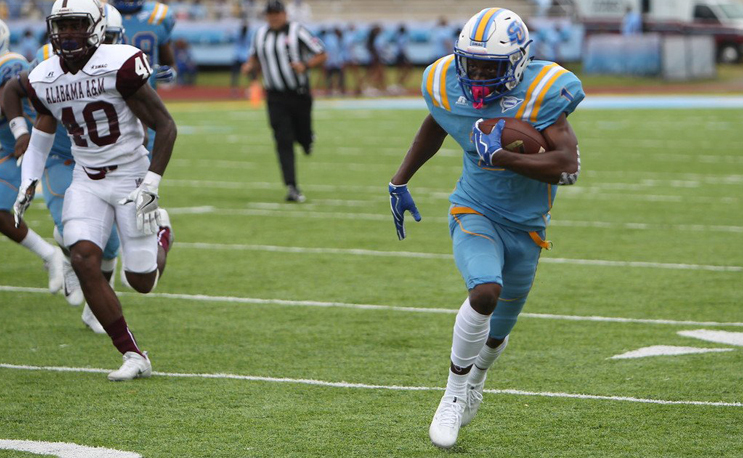 Southern had to move up its Homecoming football game thanks to Hurricane Nate, but it didn’t appear to hurt its timing. SU got big games from Herbert Edwards and Danny Johnson to come up with a 35-14 win over Alabama A&M on Saturday. Edwards rushed for 120 yards and two touchdowns, one in each half, as Southern led 21-0 before AAMU could muster its first score. Johnson, Southern’s All-American defensive back, got a chance to play on offense on Saturday and made the most of it, catching a 37 yard touchdown strike from Austin Howard. Howard, who has battled injuries all season, threw for two scores, completing 17 of 25 passes for 197 yards and no interceptions. AAMU came into the game perfect in SWAC play, but got nothing from its rushing game, which averaged less than three yards per carry. The passing game wasn’t much better, throwing two interceptions, including a Pick-Six to Johnson who returned it 57 yards for the game’s final score. Despite the poor weather and upping the start time a few hours, Southern’s attendance still managed to top 15,000. SU improves to 3-3 while AAMU falls to 2-4.